When I grew up in Nebraska, my dad owned his own business – a bakery. It kept him busy seven days a week. But once a year he would make necessary arrangements with his business, and take the family on a vacation. We almost always went to Colorado. There were a couple of exceptions, but not many. My mom and dad loved, loved, loved the mountains, which is why they eventually sold their Nebraska bakery and purchased one in Leadville, Colorado. It’s interesting to me now that I’m an adult that even though it’s about the same distance to drive to Chicago as it was to the Colorado, we never did. There were those mountains. So it wasn’t until I was way into my adulthood that I saw Chicago for the first time. And then I went and married someone from Chicago. Twice, in fact. Funny. Bill is from the south side of Chicago (where I’m quite certain he never knew Bad, Bad Leroy Brown). What I have learned is that a man can leave Chicago, but Chicago never leaves a man. At least not when it comes to eating. Bill does love his Chicago food. The most unique thing about Chicago is the number of family-owned food businesses you see as you drive down any even marginally busy street. Most are pizzerias or hotdog stands. If you’re eating Domino’s Pizza in Chicago, well, you must just be related to the owner. And people are absolutely committed to both their pizzeria and their hotdog stand of choice. Woe betide anyone who disagrees with their choice of deep dish or cracker-crust. That’s a North Side v. South Side thing, and they take it very seriously. Same goes for hotdogs. Bill grew up going to a neighborhood hotdog stand called Reds. Sometime after we were married, which means he hadn’t lived in Chicago for twenty-some years, Bill learned that Reds was going to be torn down so that an Arts Center could be built. “An Art Center,” Bill exclaimed when he heard of the impending change. “There are a million Art Centers in Chicago. They don’t need another Art Center. They need to keep Reds.” He seemed to forget that if there are a million Art Centers in Chicago, there are a million-and-a-half hotdog stands. The Art Center was built and Chicago and Bill both survived, though he’s never visited the Art Center and still grumbles every time he sees it. I tell you this because my condiment today is giardiniera, a spicy, pickley combination of cauliflower, carrots, celery, and sweet and hot peppers that Chicagoans use primarily to jazz up their Italian beef sandwiches. I for one have never been overly enthusiastic about Italian beef, a notion Bill simply can’t understand. It’s somewhat ordinary thinly sliced beef placed on a French roll that has been dipped in thin gravy. The gravy is put over the entire sandwich, and it is topped with either hot peppers (giardiniera) or sweet peppers. But I am a fan of giardiniera, preferring, however, to put it on other things, such as bratwurst, or over eggs, or on a hamburger, etc. You can buy giardiniera at the grocery store where you will find it amongst the pickles. I find it very easy to make, though it takes a couple of days since it requires marinating overnight. I use a recipe provided by Chicago native and Food Network star Jeff Mauro. 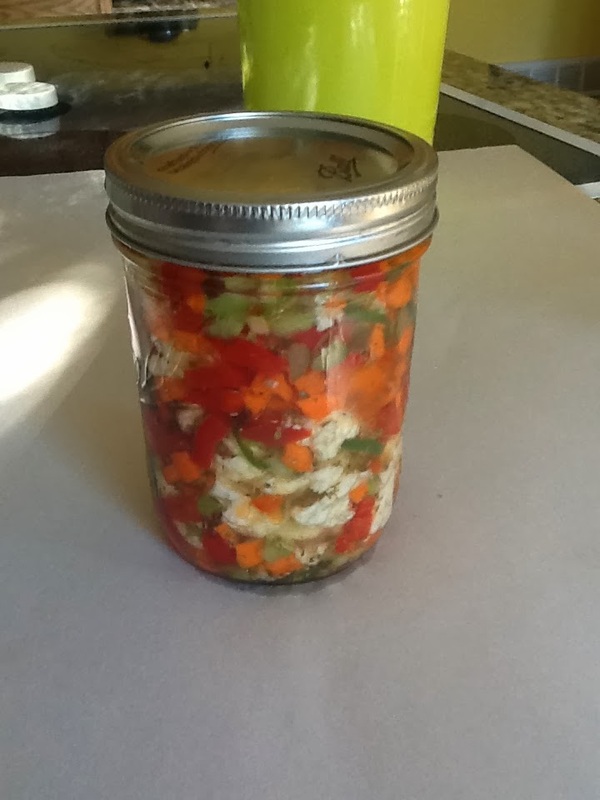 By the way, since I seem to have 4 quarts of giardiniera in my fridge, what are some other things I can do with it? Any ideas? Combine 2 c. water and the salt in a glass or non-reactive bowl. Mix until the salt is dissolved. Add the carrots, cauliflower, serranos, garlic, celery and bell pepper to the salt water and stir to combine. Cover and refrigerate overnight. Day 2, drain and rinse the vegetables really well. In a clean bowl, mix together the oil with the oregano and pepper. Add the vegetables and mix to combine. Allow to marinate overnight. Giardiniera will only get better with time. After 2 days at the most in the bowl, you can place in air-tight mason jars and keep in the fridge for up to 3 weeks. Nana’s Note: This recipe doesn’t include any vinegar. Since I’m such a fan of pickles, I put in about a ¼ c. of vinegar on the second day. The heat level depends on the peppers. I find that some serranos and jalapenos are hotter than others. Beckie beat me to the punch! I want some too.